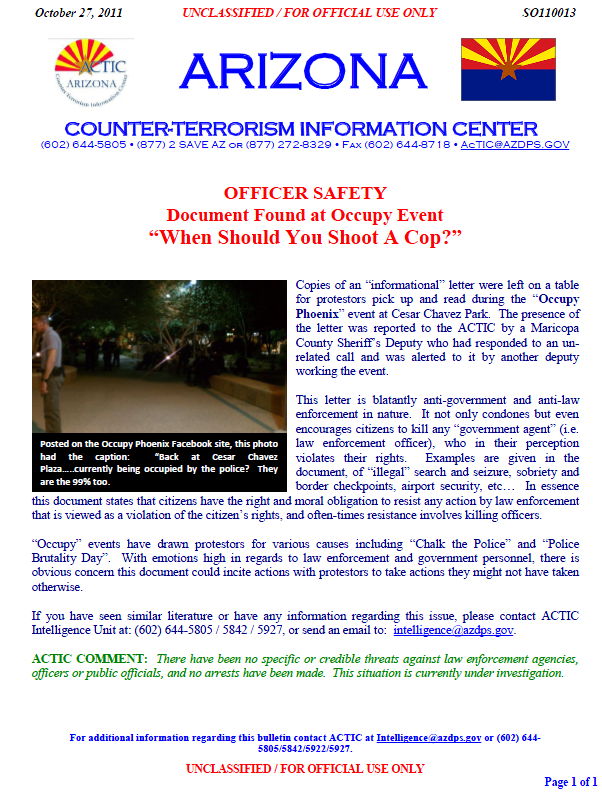 This bulletin from the Arizona Counter-Terrorism Information Center (ACTIC) was leaked by a member of the Arizona law enforcement community to a conservative radio talk show host in Minnesota. It has since been seized upon by conservative news outlets, such as Fox News and Glenn Beck’s The Blaze, as a confirmation of what they see as Occupy protesters’ violent intentions. A text version of the reported flyer has also been posted by the same talk show host. Copies of an “informational” letter were left on a table for protestors pick up and read during the “Occupy Phoenix” event at Cesar Chavez Park. The presence of the letter was reported to the ACTIC by a Maricopa County Sheriff’s Deputy who had responded to an un-related call and was alerted to it by another deputy working the event. This letter is blatantly anti-government and anti-law enforcement in nature. It not only condones but even encourages citizens to kill any “government agent” (i.e. law enforcement officer), who in their perception violates their rights. Examples are given in the document, of “illegal” search and seizure, sobriety and border checkpoints, airport security, etc… In essence this document states that citizens have the right and moral obligation to resist any action by law enforcement that is viewed as a violation of the citizen’s rights, and often-times resistance involves killing officers. “Occupy” events have drawn protestors for various causes including “Chalk the Police” and “Police Brutality Day”. With emotions high in regards to law enforcement and government personnel, there is obvious concern this document could incite actions with protestors to take actions they might not have taken otherwise. If you have seen similar literature or have any information regarding this issue, please contact ACTIC Intelligence Unit at: (602) 644-5805 / 5842 / 5927, or send an email to: intelligence@azdps.gov. ACTIC COMMENT: There have been no specific or credible threats against law enforcement agencies, officers or public officials, and no arrests have been made. This situation is currently under investigation.